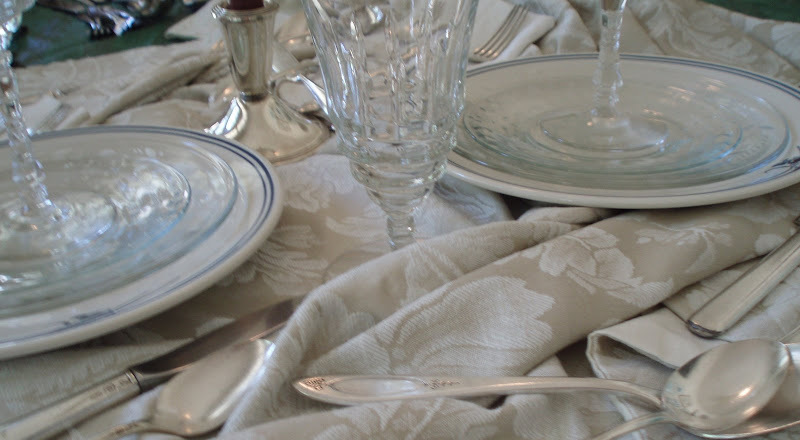 Affordable Accoutrements: Silver for Your Table! From Goodwill??? It's time again for Metamorphosis Monday and Thrifty Treasures! Please join our hostesses for the respective events: Susan of Between Naps on the Porch and Rhoda of Southern Hospitality. Please take time to leave appreciative comments for Susan and Rhoda. They both give SO MUCH of themselves to educate and entertain us week after week! They're sure to have lots of talented bloggers taking part in their wonderful events, so visit as many of the participants as you possibly can! If you've read any of my previous posts, you probably know I LOVE estate sales. Most of the nicer things I own have been purchased at estate (tag) sales. However, I also enjoy stopping by the Goodwill stores in my area ... frequently ... probably too frequently! You never know what you'll find there, and the more often you go, the greater the liklihood that you'll find something special at a good price. I normally don't dig through the flatware bins (again if you've been here before, you'll know I have a "thing" for vintage silver or silverplated flatware). I've just never had any luck at GW when it comes to silverware .... but I still take a peek in passing to see if anything looks interesting. Usually, it appears to be just a jumble of battered, rusty, lightweight, uninteresting stainless. On Friday, it was a different story. I noticed a piece of "Patrician" by Oneida (a pattern I collect) on top ... and then got glimpses of tarnished silver throughout the bin. I dug out about a dozen pieces and looked to see the price. There was a small sign saying "$3.99 a bag" and a stack of flat clear plastic bags in a box next to the bin. The bags were approximately 8 x 10 inches. I asked the cashier how much it would be for just a few pieces. She replied that it was "$3.99 a bag or 49 cents each." I'm not a math wizard, but I realized I'd be spending more for 10 pieces than for a bagfull. Well, I decided I might as well FILL it. I was a bit embarrassed, but I made sure all the pieces fit within the confines of the bag. The cashier told me not to worry about it ... "there's always more coming in." 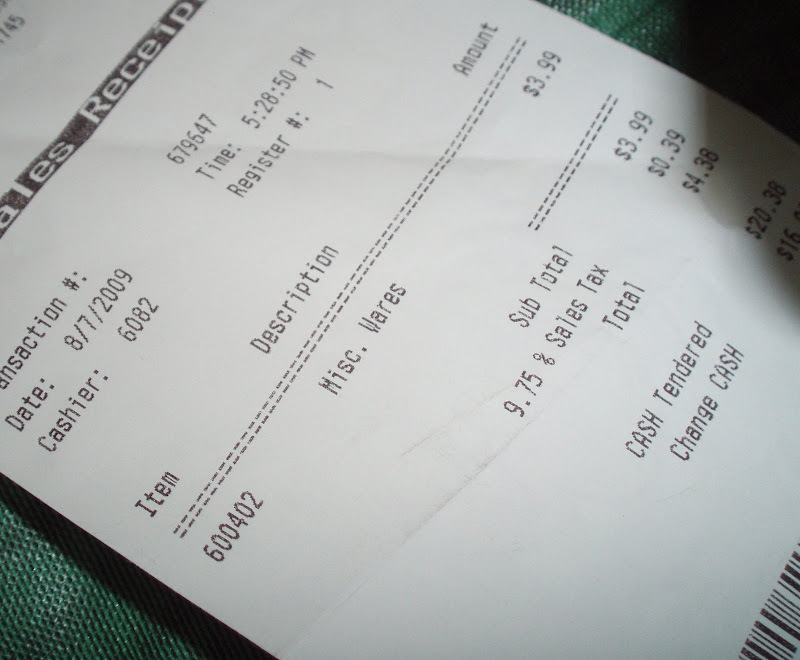 In fact, she thought customers should be given larger bags to fill for that price. Two woman came and stood beside me while I looked. I suppose it's the same as when one child picks up a toy and other kids suddenly appreciate its fascination. One of the ladies seemed more interested in plastic cooking/serving utensils than in flatware. The other had already checked out, but walked over to see what I was finding (she actually SAID that!). She told me she decided she didn't want to start over looking for more items to purchase. I was GLAD, because she had started pulling out silver pieces!!!. When I spread them out and counted, there were 119 total pieces ... for $3.99!!! I quickly selected a few pieces to polish for you today ... to show the "Metamorphosis!" OK, it's not a major makeover, but I always love watching the transformation as the pieces come back to life. For me, it's the ultimate in immediate gratification! Here they are after one application of Wright's Silver Cream (my favorite polish). They needed another going over with the polish, and then I buffed them with paper towels. Look how black the pad is! Next I washed them in warm, soapy water. Here they are ... back on the table. I put them next to a sterling candleholder ($5 for the pair on the 3rd day of an estate sale!). Unless your guests turn the flatware over and read what's on the back ... and do the same with the candlestick (and what rude guests those people would be! ), I see no visual difference between sterling and silverplate! 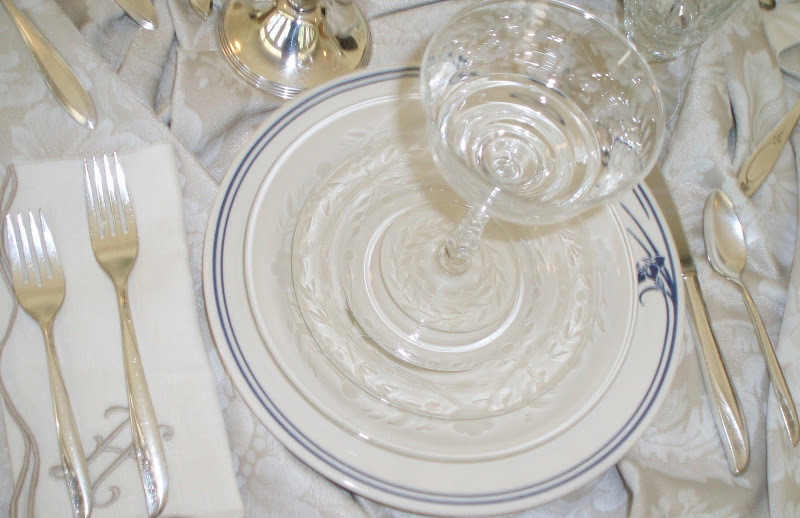 I added my old everyday Homer Laughlin plates, some Libbey/Rock Sharpe crystal stemware and plates, and monogrammed napkins from an estate sale (my initial this time!) to do "practice" place settings. The first is a 1950's pattern. These are a mixture of really old pieces. Note the solid handled knife with silverplated blade, rather than stainless. The color of the sky is coming through the solarium windows "tinting" the clear glass blue. I took a few pieces outside to show how cool silver can look on a HOT summer day when it's reflecting the blue of the sky. The white tablecloth took on a cool tone as well. 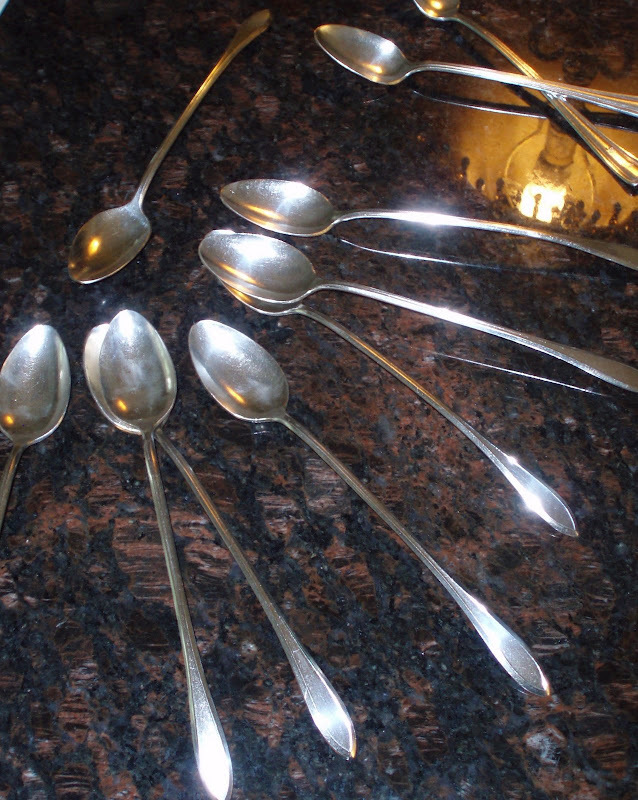 My favorite pieces I polished today ... the "Patrician" iced tea spoons. They're not just for iced tea you know. They're great to use when you serve desserts in tall parfait or pilsner glasses. They also work well with cappucinos and lattes in tall mugs. Hope you enjoyed seeing my thrifty finds. 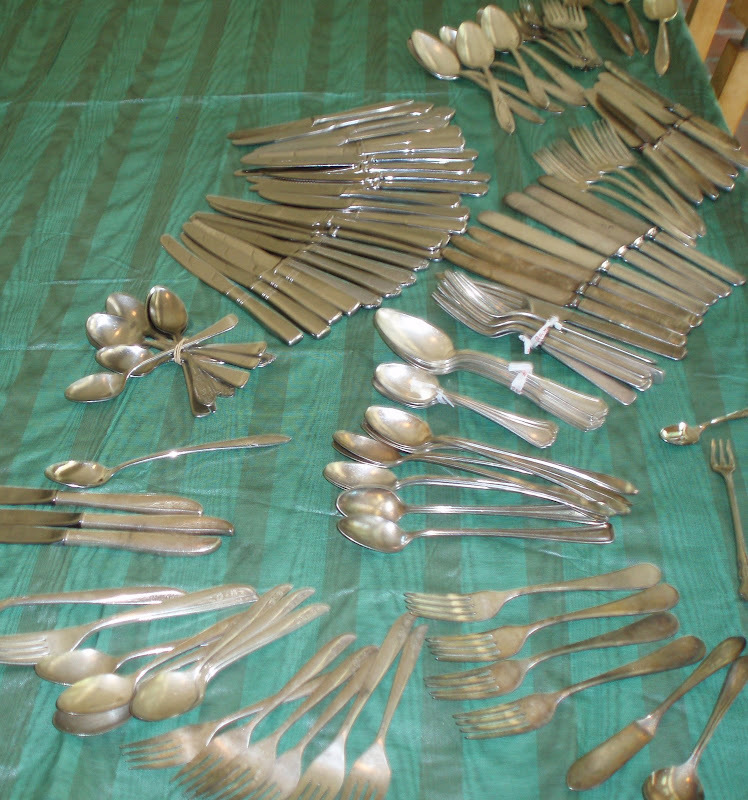 So what do you think ... was this flatware worth 3.5 cents per piece? If you have questions or comments about silver polishing, please let me know! P.S. 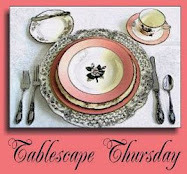 You can see "Patrician" flatware I used in a tablescape HERE. Are you serious?! That is super exciting ... all those pieces for $4. Sigh. They cleaned up so well - you are so lucky! I am getting ready to polish my thrifted silver, I'll look for your choice of polish. What a deal!! The sliverware just shine now. What a great find . . . I, too, love silver and am always looking -- and the blacker the pieces usually the better the price. Have never looked at GW, however! What a steal of a deal you got! 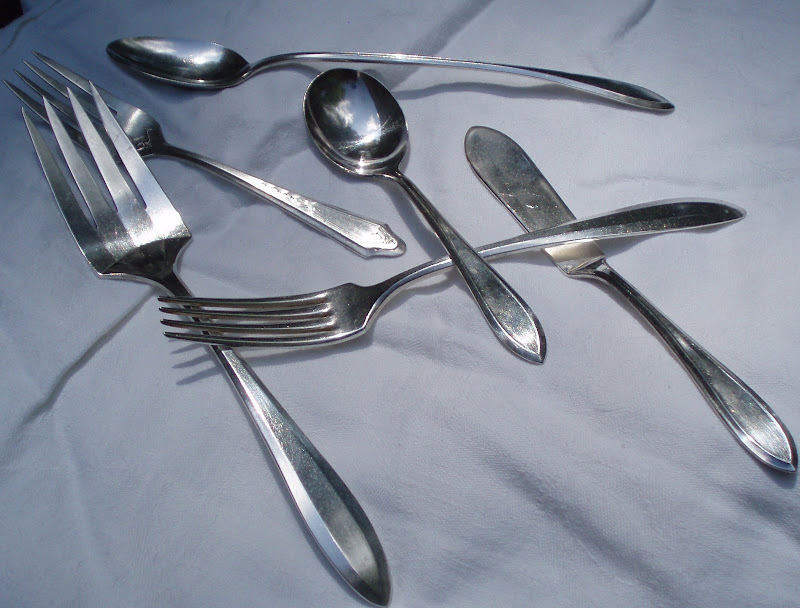 I've recently started taking a glance at the bins of flatware at the thrift stores but I always get discouraged because there's never any room to put the top pieces to view what's buried on the bottom. I think you just convinced me to have a little more patience! Lol. What a great find. It's getting harder and harder to find any old silver. Question, do you soak your siver before polishing? A lady at the Antique Store told me that was a trick she always used, said it made cleaning easier. OH MY WORD....you're killing me here! What a find and I love how it looks all polished. WOW that is a Fantabulous find! cleaned up superbly, A+++ post! I will definitely be keeping my eyes open for silver from now on :) Mon Amour! Wow, what great silver finds at GW! Your silver sure looks fantastic all cleaned and polished! Wrights is my favorite silver polish, too. Wow, Bill.....heck yea!!! it was worth it! Great deal and love the shine!!! Bill, what a fabulous find! They never have anything like that at any of the thrift stores here! Score! Great tutorial on polishing silver! Wow! I sure wish the Goodwill I go to had deals like this! They seem to want an arm and a leg for their stuff these days! Love your silver and what a fantastic deal! Great job bringing it back to life. I love the GW, some of my favorite treasures are from there! Well I guess I will have to start crossing the border to go to sales and GW in the US. Actually I don't think I go often enough to these places to check out what is there. I am sure you get such good deals because you are diligent in your searches. Bill I really thing the photo in the soapy water is a work of art. It should be printed and framed. Maybe even in a black & white. Art I tells ya. OH MY...what a find! I love silver and mismatched silver is even better! I buy silver iced tea spoons for my baking friends. We use them to stuff cream into cupcakes, cream puffs and other pastries. Wow, Bill...you did indeed "make a haul" !! I adore silver OR silverplate and, like you, I want mine to be shiny and rich looking. 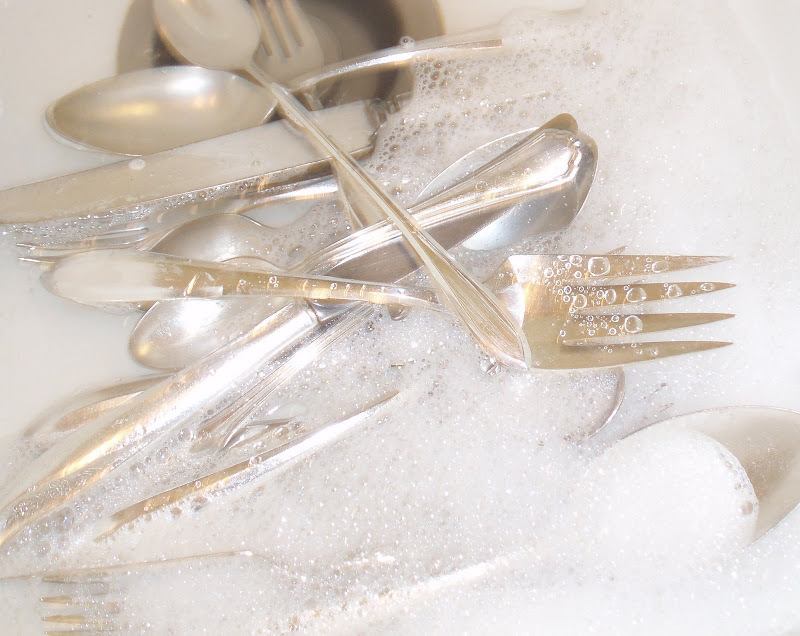 I love your shot with reflections of the sky in the flatware. Wright is my fav. polish..guess I've never really used any other. And, iced tea spoons are some of my favorite things. I love the simplicity of your pattern. There is nothing like silver. Bill, you have more heart than I do though. I don't have the patience for the polishing. I compromised on my good flatware and purchased a high end Reed and Barton stainless which I wash and dry by hand. I just think the dishwasher does something to metal. The ironic thing is, I put my good china in the dishwasher. No worries it is dishwasher safe. There is a God! Oh and BTW my flatware is a simple pattern too, but very elegant. I'm speechless!! I need to shop GW more often. The nearest one is about 45 minutes from here. Next time I'm anywhere near there, I am going by and I'm going to be looking for silver! What a smart guy you are! Most people would have just walked on by - including me! How fun! Like a kid in a candy store, I think. And more Libby Rock Sharpe - how lucky. And thank you again for identifying my vintage stemware as Libby Rock Sharpe! Wow - You did good! You really got some great finds. Thanks for visiting. I have been repurposing old/vintage jewelry off and on for years - just a hobby. You did such a beautiful job bringing those lovely pieces back to life. Your labor of love paid off well! Bill, I am so jealous! What a wonderful deal you got. 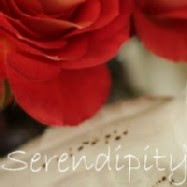 I love your blog and look forward to reading it each day. Bill, you always amaze me with your finds! I love that you got all of that flatware for that price! Isn't it fun to find things you love at a great price? I need to check out GW. I went to one in Central Florida, but I ended up paying about $6 for a duck tureen. Not sure whether that was a good price or not, but it was a cute piece. What a great find! I dig through the Goodwill bins quite frequently, and have never come up with so much good stuff. The big serving meat fork is beautiful - I love that pattern! And they look so fantastic polished! Bravo! Great find & wonderful clean up job! What a steal, and the silver makes for a wonderful Met Monday post. Now they sparkle like new. Bill, what a deal you got on all that flatware!! That is great, I know you are excited about all of that. They really polished up well. Thanks for joining the party today. That is so awesome. I wish I had your luck. I keep looking but so far I haven't hit the jackpot on silver - yet! Hi Bill, talk about the king of deals. Fabulous! Come over and check out the Rooster Party....would love for you to join us. Oh, you mentioned the Designing Women first season on DVD a while back.....I got it this morning. Can't wait to sit and look and laugh. You are so inspiring. I've two Goodwill stores close to my home and I never even go to the silverware. It's a jumbled mess, just as you said, and I just haven't taken the time to dig through it all. Now, that I've seen your treasures, that's my first stop! I love all the pieces you've found, they look terrific with your other patterns! I think it was WELL worth it! How very lucky you were, to get all the wonderful cutlery for that price. What a great deal. Loved the way they came up after a clean. 119 pieces for $3.99!!! You got some great pieces and they really look nice once they were cleaned and polished. Enjoyed reading your post. woweee! You did even better than the 2nd day of an estate sale! Next time I'm at GW, I'll be looking through the silverware bin -- that's for sure! Wow...119 total pieces for just $3.99! Talk about a great bargain...the flatware looks great...you did very well indeed. I hope to get my "flatware" post up before vacation... I keep getting sidetracked! Yeah, you did it again... Wowed me with your silver find... ok you have to take me shopping with you! I had my eye on those iced tea spoons when you pulled everything out of the "little"bag. Then they turned out to be your favorite too! Great post Bill! Oh! I have a question on cleaning silver or silver plate... A neighbor gave me a set of flatware and I used Tarnex on them but they didn't come out as beautiful as yours... What are the steps to clean silver plate? 3.5 cents apiece. Wow. To say it was a great deal would be a gross understatement! Man that one woman was gutsy. Have to shake your head at people like that. Yes, I sometimes get shoppers lingering by me too....sometimes I snapp things up close to where they stand - I have no couth.....LOL ! Man oh man, that was a fantastic buy! I am going to hit my GW tomorrow. Talk about inspiring..
Will you please pop by and enter my giveaway? Nice people like you make my world go around. Thanks Bill. What a steal! That is the best bag of goodies I've seen in a long time!! Love the iced tea spoons, they are sometimes hard to find. I was wondering if you would mind if I mentioned and highlighted your blog in one of my post. I was talking about Mojitos and I wouldn't feel right if I didn't give you the credit. But if you would rather I not mention you I'll respect your wishes. SHUT UP!! This was awesome! We do NOT have a very good Goodwill in my town :( I love silver too and gravitate to it wherever I see it!! thank you for showing what a fantastic deal you found! Wow! great post Bill. Ridiculous bargain or what? It reminds me of my antique glass ornament find day last week for 50 cents a box. We all deserve a great find day. I'm dreaming of finding a set of tea spoons like that. I've only found onsies here and there for my coffee tall mugs, I snag them up every time. This is too timely! 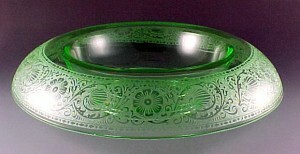 I came across your blog by accident while searching for some info on Haviland Limoge china. I am a quilter so our passions are very different but I love what you share...I also love thrift and recently posted about a Goodwill quilt purchase....I enjoyed your Goodwill story about silverplate and in two days we are having a major garage sale and DH and I just going through piles of miscellaneous silverplate and saying, no one wants this anymore....let's put $5 on the whole bag. NOW I am going to polish it and enjoy it. I do already have two sets from his family which is such fun to use with compmany - they all notice - but....can anyone have enough? And it takes up very little room. I'm so glad I read your post before getting rid of it. Yeah for Goodwill - lots of things to discover there.